Malcolm X was born Malcolm Little in Omaha, Nebraska. After a difficult and disrupted childhood Malcolm X joined the controversial black supremacist movement the Nation of Islam while he was in prison for larceny and breaking and entering. At the same time he began to use the name Malcolm X, explaining that the X represented the African family name he would never know. By the time Malcolm X visited LSE he had left the Nation of Islam and established a new religious movement, Muslim Mosque Inc, and a secular group, the Organisation for African-American Unity, to fight for the human rights of African Americans. A highly controversial figure, his visit to LSE has been the subject of great interest, coming so closely to his murder. According to The Beaver the speech received ‘prolonged applause’ and was well received, by many students. You can read The Beaver report on the LSE Digital Library. The following day Malcom X visited Smethwick in Birmingham where the Conservative MP had won the seat in the previous year’s general election on a strong anti-immigration ticket. Prior to his LSE visit, in 1964 Malcolm X had taken part in a debate at the Oxford Union, losing the vote but getting a great deal of publicity. The theme of the speech was the relationship between the newly independent African states and the Black Moslem movement. You can read the surviving text of the speech. 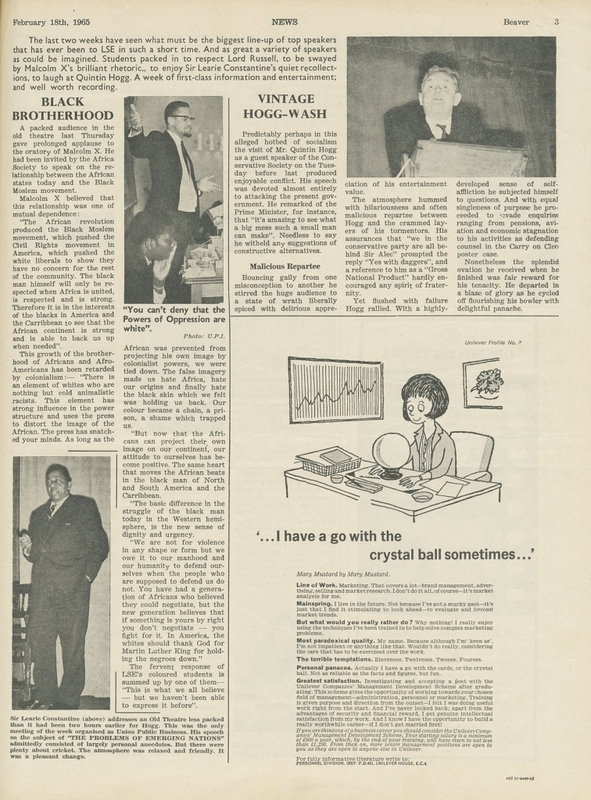 Following Malcolm X’s death The Beaver followed up with an editorial on Malcolm X and his legacy reporting that: ‘’There is no doubt that Malcolm X was an orator and political leader of genius.” Though there would be many views on the nature and impact of his views and campaigns. The full editorial is available online. If anyone reading this can remember the visit it would be great to hear your comments. Read the Beaver’s own commemoration here. I just saw the piece about the talk by Malcolm X 50 years ago in the alumni events newsletter. As a second year student in the B.Sc (Econ) program, I attended the talk in the Old Theatre, which was packed. What I recall is that he was a powerful and compelling speaker, as noted in the article. I also remember that there were two other very impressive speakers at the same venue within a few days of this — Bertrand Russell, who was well into his nineties, and frail but but still extremely sharp, and Quintin Hogg, who almost became the prime minister in 1963. A nice reminder of the wonderful opportunities offered outside the classroom at the LSE!